Tsang’s “full-body quotation” of Baggs speaks to several major issues at the heart of her practice. Foremost is her endeavor to communicate the impossibility of communication, the ways we can never fully understand other people. Simultaneously, Tsang makes space for marginalized narratives through playing with modes of language that allow for open- ended understandings of others. 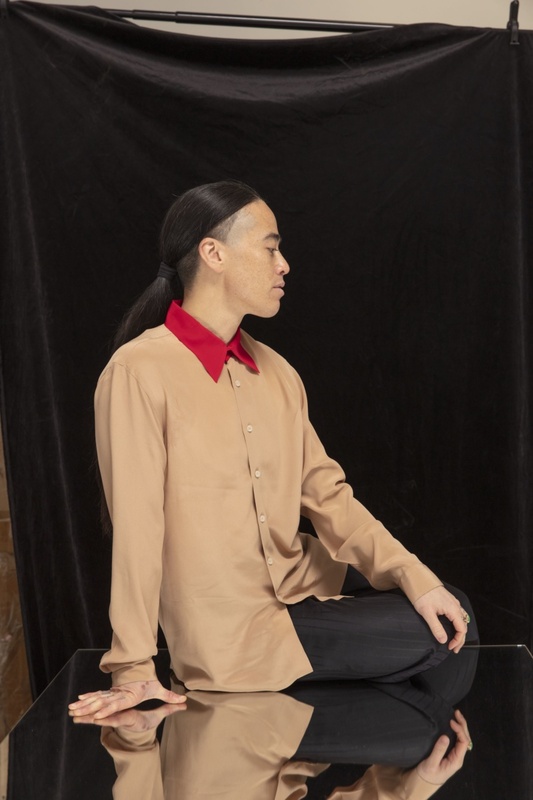 Whether communicating through dance, poetry, translation, or other methods of storytelling, Tsang evades using language or images as agents of fixity, creating forms of connection that can accommodate queerness as a continual process of becoming. In the decade since The Shape of a Right Statement, Tsang has continued to address these themes as her practice has gained wider institutional recognition. In the past year alone, she was awarded a MacArthur “Genius” Grant, nominated for the Hugo Boss Prize, and received a United States Artists fellowship. Tsang’s career success has positioned her in such a way that she now speaks about marginality from the institutional center. She is conscious of the ways that her position is all too easily framed as representative of an increased visibility of queer artists of color. Tsang aims to pivot the conversation away from visibility, toward legibility and communicability. Tsang first gained widespread recognition for her film Wildness, which premiered at MoMA in 2012—the same year she was in the Whitney Biennial and the New Museum Triennial simultaneously. The film came out of Tsang’s experience co-hosting a weekly party of the same name at a queer, Latinx and immigrant bar in Los Angeles called the Silver Platter, and mixes fiction and reality, telling the story of the bar through its owner, loyal patrons, and through the imagined voice of the bar itself. The methods Tsang developed in Wildness remain enduring qualities of her work. In subsequent films, she continues to be fascinated by translating real-life experience into fantasy and making work out of a collaborative process. Tsang’s community is a major part of her practice and she often creates work in collaboration with poet and scholar Fred Moten and her partner, performance artist boychild, among others. “I love to collaborate with musicians and performers,” Tsang explains. “I’m always looking for ways to translate my experience of someone live into a cinematic language. My practice is very collaborative and really about trying to create the circumstances for things to be possible and then let life unfold.” Outside of her collaborators, Tsang’s work is best contextualized alongside other multi-hyphenate artists born in the 1980s, including Korakrit Arunanondchai, Zackary Drucker, and Mariah Garnett, whose works also deal with the impossibility of language, recovering queer histories, and the disruption of a teleological understanding of time with cyclical strategies.